ZAMIL Steel Construction Company has successfully completed the engineering, procurement and construction (EPC) of several customised pre-engineered steel buildings for a GCC project in Saudi Arabia. 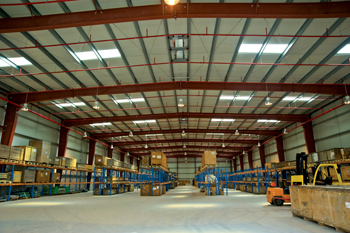 The project, undertaken for the Gulf Cooperation Council Interconnection Authority (GCCIA) in Jubail, Saudi Arabia, called for the design, fabrication, supply and erection of more than 230 tonnes of pre-engineered steel buildings, including two warehouses and an office storage building owned by GCCIA and located in the eastern region of Saudi Arabia. This project marks the first complete EPC turnkey venture for Zamil Steel Construction Company, which provided complete services as an EPC contractor for the entire project. The company was responsible for the design, supply and erection of two steel warehouse buildings that included fire suppression and racking systems, along with a concrete administration building and all supporting utility services and external works. “Zamil Steel Construction Company has been extensively involved with leading regional and multinational companies, supplying pre-engineered buildings and structural steel components for important projects that are complex in nature. This initial EPC turnkey project for Zamil Steel Construction Co provided customised and integrated delivery solutions that also adhered to strict principles of safety and quality in design. The warehouse complex has been officially transferred to the client, who expressed satisfaction with both the quality of work and completion time, which we can proudly say occurred ahead of schedule,” said Nawaf Al Zamil, vice president of Zamil Steel’s Building Products Group. Zamil Steel Construction Company LLC was established in 2007 as a limited liability company in Dammam, Saudi Arabia. It is a Saudi company owned by Zamil Industrial Investment Company. Currently operating in Saudi Arabia, it caters to clients who require a one-stop shop for industrial and commercial steel buildings. Moreover, it provides EPC services to customers setting-up new projects in different market sectors such as factories, shopping malls, warehouses, office buildings, distribution centres, commercial showrooms, aircraft hangars, supermarkets, workshops and hypermarkets. The scope of work includes the design, fabrication and supply of steel buildings, related civil and concrete works, erection of the steel buildings, firefighting and fire alarm systems, architectural material and mechanical, electrical and plumbing (MEP) works on the basis of turnkey through full site management teams.